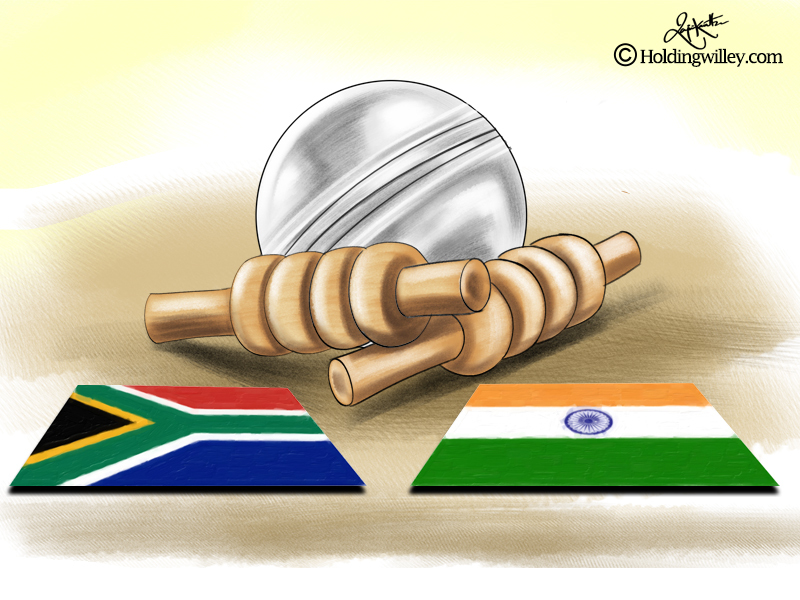 India won their first bilateral ODI series against South Africa away from home by a comprehensive 5-1 margin. They played a superior brand of cricket and outplayed the hosts in all departments. Kohli was in scintillating form and the wrist-spinners made the South African batsmen look like novices. There are still some concerns in the Indian camp regarding their middle order and Mahendra Singh Dhoni’s form with the bat. They should savor the victory before looking to rectify their faults and put in a more clinical performance. India’s captain scored 558 runs from 6 innings with an average of 186 and a strike rate of 99.46, making 3 centuries and a fifty. This was a record for most runs scored by any player in a bilateral series. In the zone, he played shots all around the park while keeping the ball on the ground, minimizing his chances of getting dismissed. When the bowlers pitched it up he drove them. When they bowled short, he cut, pulled and hooked them into submission. And he was very versatile: in his unbeaten 160 at Cape Town he scored just 60 runs in boundaries and ran 100; but in the final ODI at Centurion he scored 88 of his 129 runs in boundaries. He was in imperious form and was adjudged the Man of the Series. Many feel he is now the greatest ODI batsman of all time. A bit more predictable than Kuldeep, but he was always brought on before Kuldeep as soon as the first Powerplay ended. His clever variations in line and length were brilliant and he spun a web around the Proteas batsmen. Apart from the ODI at Johannesburg where he was handicapped by the wet ball, Chahal was almost unplayable. When both the spinners bowled in tandem the Proteas batsmen were confounded and looked clueless. Chahal took 16 wickets at an average of 16.37 and an economy rate of 5.02. He took a wicket every 20 balls and had the hosts in pieces. Since the Indian management placed emphasis on wrist spin, Kuldeep has set the stage on fire. He was hit occasionally, but never got disheartened, always looking to dismiss the batsman rather than contain runs. Most of the Proteas batsmen (even the top order) failed to pick him and trying to play a wrist-spinner off the pitch was a recipe for disaster. He took 17 wickets at 13.88. His economy rate of 4.62 was outstanding and he took wicket every 3 overs, which was phenomenal for a spinner. Bumrah was the find of the tour for India in the Test series and he continued his brilliant form in the ODIs. He adjusted his bowling and was very rarely smashed. He seemed to bowl yorkers almost at will and his slower ball was difficult to pick. He took 8 wickets at an average of 20.87 and was the only Indian bowler to have an economy rate under 4 (3.97). He justifies his reputation as one of the best bowlers at the death and his bowling with the new ball has improved in leaps and bounds. Much has been written about Dhawan’s shortcomings against the short ball and genuine pace, but in the ODI series he showed that he was willing to take on the short ball without any fear. He was close to his best, driving and cutting with élan and scoring 323 runs with one century and two fifties from his 6 innings. He was also undeniably guilty of not batting through and throwing away his wicket with injudicious shots. With the fate of the series already decided, Thakur was given a chance in the last ODI at Centurion and he grasped it with both hands, taking 4/52 in 10 overs. India will select at least 4 seamers for the 2019 World Cup and with just Bhuvi and Bumrah as certainties, there are still 2 spots up for grabs. Thakur has certainly put his hand up and will, over the next few months, get more opportunities to stake his claim for a berth on the plane to England in 2019. With India’s top 3 in such good form, Dhoni did not get many opportunities to make a mark. He batted in just 4 innings, scoring 69 runs at an average of 34.5 without a single fifty. He has lost his much-vaunted ability of scoring quickly at the death and now needs a bit of time before he can go for the big shots. He batted at number 6 in three innings and number 7 in one innings, which seemed too low a position since he needs time before hitting big. It might be worthwhile to promote him to number 5 and give him a bit of time to construct his innings. His keeping was top class as usual and his advice to both the spinners on what lines and lengths to bowl to a particular batsman were invaluable. Kohli relied on him for getting the angles right with the field placements. After his magnificent attacking 93 in the first innings of the first Test at Cape Town, Pandya has had a horror run with the bat. This is especially damning as he is a batting all-rounder whose bowling is considered his weaker suit. He scored just 26 runs in 3 innings at an abysmal batting average of 8.66. In the last 3 ODIs, with Jadhav absent, he was expected to complete his full quota of 10 overs and he seemed to thrive on the responsibility. He took 4 wickets from 44 overs at an economy rate of just 4.9, which is terrific for the 5th bowler. And he took some good catches in the field. He has the support of his captain and has no real competitor for the place of seam-bowling all-rounder in the team. Iyer had a promising start to his ODI career against Sri Lanka but failed to carry his form to the Rainbow Nation. He played in 3 matches while competitors for the same spot like Manish Pandey and Dinesh Karthik warmed the bench. He got starts in both the innings that he batted but was unable to capitalize in the slog overs. He scored 48 runs at an average of 24 and a strike rate of 82.75. Even though he took a blinder to dismiss Aiden Markram at Centurion in the last ODI, he dropped a couple of sitters in the field. He will get more chances to stake a claim for a spot in the middle order for the 2019 World Cup. Bhuvi had a poor series with the ball by his high standards, taking just 2 wickets at a high average of 100.5 and an economy rate of 6.09. One reason for that was his high workload since the end of last year. He looked knackered. He was impressive with the bat, scoring 40 runs at an average of 40 from 3 innings. He did not have many strokes but played within his limitations and did not throw his wicket away. His average performance in this series was just an aberration and not much should be read into it. In 2017, Kohli had said that they viewed Rahane as a back-up opener in ODIs. Before this ODI series began, he said that Rahane would be given a run at the number 4 position, as he had batted there in the 2015 World Cup. He started the series well with a 79 at Durban that enabled India to win convincingly, but his form petered out as the series progressed. He missed a golden opportunity to cement the number 4 position for himself. His fielding was at his usual high standard and he deserves to be given an extended run in the middle order. Rohit Sharma is considered one of the leading players in this format, but apart from his 115 off 126 balls at Port Elizabeth, he had a poor series. If you were to analyze all the big innings that Rohit has played in ODIs, you would see that he takes his time initially, playing the bowling on its merit before going berserk in the last 10 overs. In this series, he tried to force the pace very early in his innings. Apart from his solitary ton he did not even cross 20 in each of the other five innings. He played in the first 3 matches but batted in just 1 innings, scoring a solitary run at Cape Town. He bowled 6 overs in the series, conceding 30 runs without taking a single wicket. What has worked in his favour in the past is his ability to bowl useful off-spin and his golden arm. However, he didn’t do enough with the bat in the last few matches and needs to contribute more before the selectors’ patience runs out.